Set in wide, landscaped gardens, this five-star deluxe property boasts more than 200 palm trees the is a beautiful resort located on the white sands of Jumeira Beach. The resort's facilities include 255 luxurious guest rooms, a business center, an outdoor heated pool and numerous restaurants. Guests can enjoy International dishes at the Palm Garden Restaurant, Chinese cuisine at the Peacock and Australian steaks as well as fresh seafood at the Grill Room. Just minutes away from the world famous Emirates Golf Club, and close to Dubai's Media City and Internet City, the hotel is only 25 k/ 15 miles from the city centre and 30k/ 28 miles from Dubai International Airport. 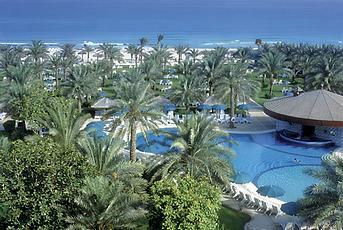 Sheraton Jumeirah Beach's total refurbishment has involved redesigning and refitting all the bedrooms. Now the 255 stunning appointed guest rooms are decorated in cool, fresh Mediterranean stule. All have private bath and shower, individually controlled air conditioning, IDD voice mail phones, dataport, satellite TV with interactive system, radio, safe, minibar, hairdryer and trouser press. Non-smoking rooms and accommodation adapted for which has an exclusive terrace overlooking the waters of the Gulf. Towers and Towers Suites services include: VIP amenities, complimentary breakfast, limousine airport transfers and all day hospitality in the roof-top Panorama lounge. Towers Suites include butler service. Electricity: 220 volts, bathrooms 110/220 volts.